Ever since I was a child, I had a strong desire to linger in the rugged terrains of Rajasthan and especially on a camel safari to feel like a sultan. It took me more than 20 years to fulfill my desire until recently when I found myself in the holy town of Pushkar in the Aravali range in Rajasthan from the point where I can confront the Great Indian Thar Desert. 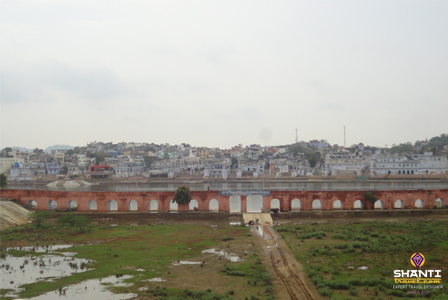 It was a mixed moment of exhilaration and transcendental thoughts knowing the fact that it is one of the oldest town of India where the legends associate the creation of Pushkar Lake and later the town by the Hindu god of Creation Lord Brahma himself. Pushkar is a scenic town located in one of the oldest mountain ranges in the world and has ample vivacity to make travelers spellbound with its curvaceously spread small sand dunes, mystical hills, and the blissful sunrise & sunset. After checking in at the pre-booked hotel, I headed straight towards Panch Kund Road to do a Camel back ride in order to get the hang of local mode of transport. With enormous excitement in my kitty, I hopped up on the camel and pulled off from the main road via Guruduwara (Sikh Temple) towards a concrete trail leading to the Desert. I passed the Rose & Mariegold flower fields situated on the lakebed that is grown to please the gods. While doing the Camel Back riding near Pushkar Lake you will get an overwhelming aerial view of the ghats and temples surrounding the lake. After the first 20 minutes of my Camel trekking in Pushkar I can see a group of likeminded travelers on their Camel caravan following my ride’s footstep. Gradually as I was going further, the concrete roads made way to a village road, which later became pebbles and transformed into powdered pale yellow sand on its final phase. 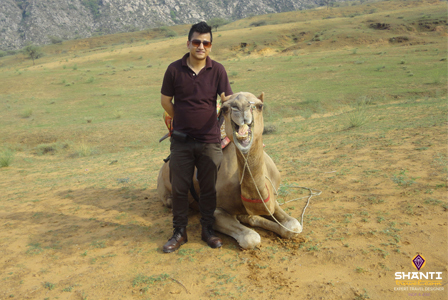 By now, I was inside the desert in a place that has a repute of being an epicenter of one of the largest camel fair in the world which is popularly known as Pushkar Camel Fair. The view from this part of the summit is truly awe-inspiring as I can admire the picturesquely carved steep stairs leading towards the Saraswati Temple situated on the top of the hill. Hundred meters further, I see a herd of sheep grazing the green grass that might have become juicier than ever after the rain spell from the previous day. 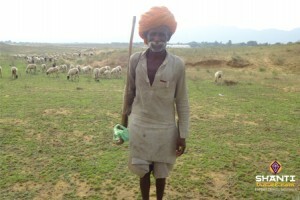 The shepherd was generous enough for allowing me to take his picture. Having all such wonderful natural delights by my side, I could hardly remove the first finger from my camera button. Inflicted by the utter state of euphoria I decided to get down from my camel and adore the beautiful sunset cascading down the hills & the dunes. Took few shots of my camel first and after first three shots of his I realized that he could give a smiley pose as well. Honestly, I can imagine& see him smiling so I named him “Smiley Man”. As I can see the sun going down, I realized that the time has come to go back with all the joyful moments being kept alive just to have a another chance and reason to visit again this tranquil place. You can visit Pushkar all-round the year but the best time to see the pastoral lifestyle is on October. On this time of the year come with an open mind and soul to witness the famed Pushkar Camel Fair and also to purify yourself in the sacred water of Pushkar Lake during Karthik Poornima (full moon night) from all the sins. However, in October it will not only be Pushkar to visit; also look forward to travel beyond the usual royal destinations of Rajasthan. If you have similar travel plunge than I recommend you to travel with Shanti Travel who have a similar program http://www.shantitravel.com/en/north-india-tours/rajasthan/pushkar-fair/ and take all the pride of being an expert in tailor made travel plans for all your wanderlust.